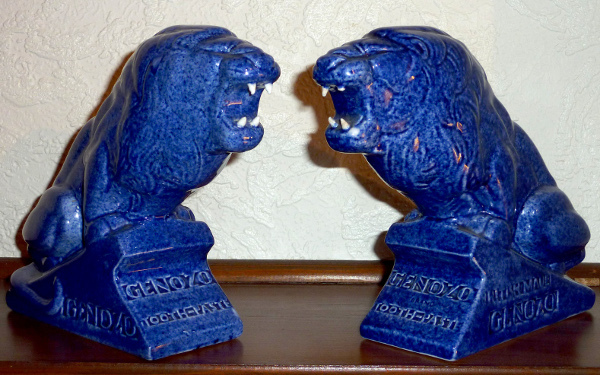 Recently a friend approached me with an interesting pair of pottery lions, to see if I knew anything about them. The Ashtead Pottery was only in operation from c1923 until 1935 and was founded to help disabled ex-servicemen. These Genozo advertising lions were made to promote Genozo toothpaste and are an attractive piece of Art Deco advertising memorabilia. They come in two sizes, of which my friend’s pair are the smaller. These lions also have an interesting military connection, as they were designed by Percy Metcalfe (1895-1970), who was well known for his gallantry medal designs, most notably the George Cross. This pair of lions have been entered into an auction sale by my friend, and will appear at Tennants Auctioneers in their Spring Fine Art Sale this Saturday, 21st March 2015, lot number 450. To view more information on the Tennants auction – click here. This entry was posted in Auctions and tagged Ashtead pottery, Auctions, Genozo, Percy Metcalfe, Tennants on March 16, 2015 by Perfect Pieces.